The 2013 Ford Mustang GT benefits from a slight bump in power to 420hp and a fairly substantial exterior refresh – both of which work together to help the mighty Mustang to be one of the most exciting and entertaining cars to drive in the modern American market while also being one of the most head-turning cars on the road today. The most noticeable changes to the 2013 Ford Mustang GT Premium are on the outside – where Ford has revised the front and rear fascias to allow the newest models to stand out from the 2012 Mustangs with styling cues borrowed from the Shelby GT500. Where the 2012 Mustang had a hood that extended out over the grille and front bumper, the 2013 Mustang GT has a front fascia that includes the upper grille area; extending up to create the front of the topline of the car. The revised hood, which features a row of heat extracting vents on each side, meets up against the rear most section of the fascia to improve aerodynamics and give the car a more aggressive look similar to that seen on the GT500 over the past few years. The 2013 Mustang GT Premium headlights feature a standard projection setup with the headlights set to the inside while the turn signals are enhanced and moved to the outer edge of the headlight assembly. While the front fascia has changed a great deal from 2012 to 2013 – the Mustang GT still sports the massive grille-mounted foglights introduced back in the early days of the Mustang. Along the side, the 2013 Ford Mustang GT Premium doesn’t look much different from 2012 models shy of new wheel packages but when you get to the back end – the newest Mustang GT stands apart from the outgoing versions. The basic shape of the rear end is the same with the taillight mounted on a plane that angles slightly towards the heavens with the GT badge proudly displayed in the middle via the large centrally mounted logo. Flanking that large, distinct badge on both sides are new taillights that still present the familiar Mustang 3-light design but a new design includes LED outer lenses that surround central lights that turn from red to white when you go into reverse. When turned off, these new taillights have a dark, sinister look that is accentuated by the black panel running between the taillights and the new black trim around the license plate. The lower back end of the 2013 Mustang GT is also finished in body color where the 2012 models had a great deal of black trim around the bottom – although both lower rear fascias house the bright polished dual exhaust tips. I have really liked the look of the Ford Mustang since the introduction of the S197 platform in 2005 but this latest refresh for the 2013 model year has, in my opinion, created one of the best looking models in the history of the fabled Ford Mustang. The design offers as much function as form, allowing it to turn heads on the road and at the track with a total look that personifies modern American muscle. Inside, the 2013 Ford Mustang GT Premium takes a fairly simplistic approach to the ideal muscle car interior. While there is plenty of leather from the Recaro seats to the shift boot to the door panels to the steering wheel, the large silver dash area and black dash pad look great without much fuss. The Mustang doesn’t have stuff poking out of the dash or gauges on the passenger’s side and it doesn’t need to…so in this case, less is really more. My test car was fitted with the standard stereo system but that shouldn’t be looked at as a bad things as the Shaker system sounded great whether listening to the radio, a CD or the integrated MP3 system. Those who want more high tech gadgets can opt for a large touch screen that controls the interior functions but for those who want to go fast above all else – the standard stereo is great. The gauges of the 2013 Ford Mustang GT Premium include the two massive analog gauges with an old school dial design with the speedometer on the left and the tachometer on the right. In the middle is the 4.2” message center that houses the driver information center and – more importantly – the new Track Apps that we will discuss later on. The GT Premium is also fitted with the MyColor system that allows you to adjust the interior colors based on your personal preferences and like every other vehicle I’ve had with Ford’s customizable lighting package – I absolutely love it. The Mustang system is more elaborate than the system in other vehicles, allowing you to adjust the outer halo of the gauges, the gauge faces themselves and the interior lighting that includes the footwells, the cup holders and the lighting door sills that sport the Mustang name. I love being able to customize my vehicles and being able to literally create the exact colors that I wanted via the MyColor system is a great touch that you don’t get from the competition. My 2013 Ford Mustang GT Premium Coupe was fitted with the gorgeous leather Recaro seats borrowed from the Mustang Boss 302 and for those who have the extra $1,600 to throw around – these are some great looking and comfortable race seats. The Recaros are very deep, with large base and side bolsters that help to keep the driver and passenger pinned soundly in place when hammering the Mustang GT around even the sharpest turns. More importantly, these seats are comfortable on a long highway drive with plenty of padding that you might not expect from a true racing seat. Finally, while proving a great sound system, impressive customization and a comfortable ride – the blacked out interior setting of our 2013 Mustang GT test car just looks fast. This is really how a muscle car should look inside right down to the Recaro sport seats. The 5.0L V8 engine in the 2013 Ford Mustang GT Premium offers 420 horsepower and 390lb-ft of torque when running on premium gasoline – an increase of 8 horsepower compared to the 5.0L mill in the 2011 and 2012 Mustang GT models. As was the case with the 2011 and 2012 Mustang GT featuring the new 5.0L, when running on 87 octane the engine produces “only” 402 horsepower and 377lb-ft of torque but trust me – paying the extra 20 cents a gallon is well worth the cost to pick up the extra 18 horsepower and 13lb-ft of torque. Don’t get me wrong…the 2013 Mustang GT feels awesome when running on regular fuel but spending the extra cash on premium gas adds that extra oomph. Our 2013 Mustang GT Premium Coupe was fitted with the 6-speed manual transmission and I loved it. The clutch is surprisingly user-friendly for such a powerful vehicle but for experienced drivers, it should only take a few minutes to get a good feel for how this car likes to be shifted. Those who have less experience should find that the Mustang GT is an easy vehicle to get in and drive even if the performance aspect of driving might take newbies a little more time to master…but such is the case with such a high performance vehicle. Our test car was also fitted with the 3.73 rearend gear package, which helps to bolster low end acceleration but the 6-speed manual transmission still allows the engine to run at fairly low RPMs on the highway. This configuration makes the Mustang one hell of a lot of fun to drive but it also affords the capabilities to yield an advertised 15mpg around town, 26mpg on the highway and 19mpg combined. In my experiences, I was able to achieve better than 19mpg during each tank of gasoline – with a final average of 20.3mpg based on total mileage and total fuel consumer while driving the new Mustang. Also, during one long stint of all highway driving where I was cruising smoothly around the speed limit, the Mustang GT is very capable of delivering that forecasted 26mpg. I did find that when my drives were mostly around town with lots of stop and go (which means lots of fun launches), fuel economy figures would quickly get down around the 14-15mpg mark but it is a 420 horsepower muscle car. If you are THAT worried about fuel economy you should probably not be shopping for a muscle car but for those (like myself) who are very happy with a muscle car with such impressive performance capabilities that still averages better than 20mpg; the 2013 Mustang GT offers great fuel economy for the class. Now that fuel economy is out of the way…onto the good part. The 2013 Ford Mustang GT is equipped with a performance timing system built into the center information screen in the gauge cluster that allows you to measure all sorts of parameters including 0-60, quarter mile, and 60-0 times among many others. While playing around with this feature (that I loved and think that every performance car should offer), I was routinely able to turn out 0-60 times in the high 4 second range while hitting quarter mile times in the high 12s. I have seen others turn in better times with the on-board measurement system with some of the more impressive examples showing the new Mustang hitting 60 from a stop in just 4.6 seconds while running quarter mile times in the 12.7 second range – the private area in which I did my higher speed testing didn’t have the best footing for the launch but that didn’t stop the Mustang GT to be an incredible amount of fun to drive. When you launch the 2013 Ford Mustang GT hard, traction is quite a challenge but with a little slip you can get out of the hole in a major hurry. First gear is incredible steep and short followed by an almost equally brief second gear but when you get into third – you really come into the powerful wheelhouse of the revised 5.0L V8 with 420 horsepower. At no point between a hard launch in first gear and shifting into fifth gear does the new Mustang not keep you shoved firmly back in your seat and unless you hate driving fast – it is nearly impossible not to smile like a butcher’s dog as the Mustang rockets from a stop to well beyond the 100 mile per hour mark in just over 10 seconds. The Mustang has not always been known for its supreme handling capabilities but over the past few years, Ford has worked to improve the suspension setups and the 2013 Mustang GT is a fine illustration of the fruit of their labors. The Mustang has a powerful, sporty stance that just screams muscle car but unlike past Mustangs – the 2013 Mustang is just as impressive on a road course as it is on the drag strip. The suspension is stiff, preventing almost all body roll when cornering while the optional Brembo braking package allowing the car to practically stop on a dime for those tight turns. On the highway, the Mustang still offers a sporty ride without it being rough like some other past muscle cars so buyers of the 2013 Mustang GT Premium will not have to compromise handling for straight line performance. Out on the open road, the 2013 Ford Mustang GT Premium is as driver-friendly and quiet as it is fuel efficient with the sixth gear keeping the revs low enough and the exhaust tone quiet enough to easily carry on a conversation. However, when the need arises to drop back a gear or two and put the hammer down – the new Mustang GT effortlessly climbs to speeds that most drivers will never reach. It is truly an incredible car to drive whether launching from a stoplight, speeding down the highway or cutting through the curves of a twisty road. The 2013 Ford Mustang GT Premium Coupe has a look that turns heads everywhere it goes with performance capabilities that will allow it to beat pretty much any stock or near-stock vehicle you come across on the street. Our test car was priced at $39,475, including the leather Recaro seats from the Boss 302 (a $1,595 option), the Brembo brake package which includes unique 19” aluminum wheels wrapped in summer performance tires ($1,695), the security package system ($695) and the 3.73 rear axle ($395). Those who want to save some dough can opt out of the Recaro seats, the Brembo brakes and the security package and have the same incredible driving experience (albeit with slightly reduced stopping abilities) for around $35,490. This includes the $34,300 base price of the GT Premium Coupe, the $395 gears and the $795 destination fee. This is a car that might have you heading to the gas pump more often than your snotty hybrid drivers but the 2013 Ford Mustang GT is so much fun to drive – when putting gas in the car I couldn’t help but think that I was just paying to be able to have more of the awesome driving experience offered by the Mustang. After filling up, you have hundreds of miles to continue loving your time spent behind the wheel of the awesome 2013 Mustang GT Premium and in my opinion – that is money very well spent. If you are in the market for an American muscle car, the 2013 Ford Mustang GT Premium Coupe should be on your short list with comparable performance to the cross town rivals with more customization and a lower price tag. While our test Mustang carried a price tag all loaded up nearing $40k – you can get a 2013 Mustang GT Coupe (non Premium) for right around $30k if you truly only care about going fast on a budget. 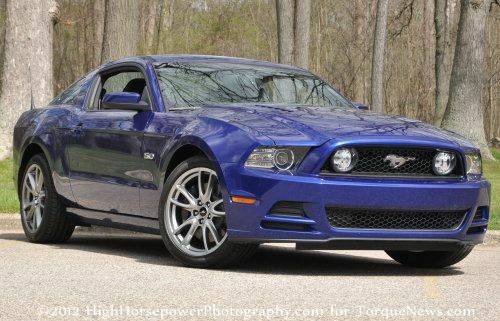 Dare I call the 2013 Ford Mustang GT Coupe one of the best Mustangs of all time? I do…and I do so confidently. Check out the gallery on the right by clicking any of the thumbnails for a look at our 2013 Mustang GT test car inside and out, day and night. I wonder if those Ford engineers made it "420" horsepower for a reason?